The World Music Drumming is an innovative, cross-cultural curriculum that teaches fifth grade students how to play African music through actual conga drums. We are amidst this wonderful 6 week cycle. 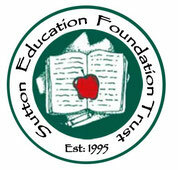 I would like to take this moment to thank SEFT for providing an additional grant for the program this year. Through this purchase of new instruments, we will in May, for the first time, be able to take this drumming and lead it into the style of Latin music. The "Understanding you Teen" Parenting Series was very well received by the Sutton Community. Parents across the district, as well as teachers and members from the community came to see our speakers and learn first hand from experts in the field on how to nurture and support their children. Parents appeared to appreciate the opportunity to learn about the topics presented. I was particularly impressed with the feedback we got regarding how parents felt good to know that they were not alone in the struggle/ joy of parenting. I was also really impressed with how open parents were during the question and answer segments of our presentations. You could see a true desire to learn about how to best support their children, while maintaining appropriate boundaries and expectations. The issues that our children are facing today feel more emotionally charged then they appeared when many of the parents and teachers were growing up and as a result can be very daunting and scary for a parent/ educator to know how to appropriately support and help children cope. These workshops gave some concrete strategies to handle some of the harder parts of working with children, as well as gave them ways to capitalize on our kids strengths and foster a resilient positive young adult. The Environmental Science students have planted four containers of flowers and strawberries thanks to your generous grant. They conducted soil testing today on "all natural" potting soil and we will use the plants during the next few weeks when we discuss photosynthesis, cellular respiration and the carbon cycle. Unfortunately, the weather has not been very spring-like so the planters will remain inside until the weather improves. Thank you again for providing funding to enrich the curriculum.